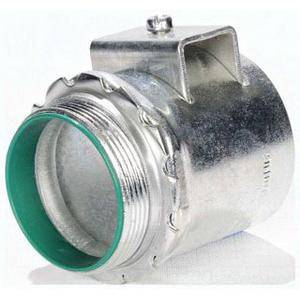 Sepco Big Bite Insulated straight connector of trade size 1-Inch, is suitable for use with 1-Inch knockout, armored cable, metal clad cable and flexible metallic conduit. This connector features 1-Piece construction for extra strength and zinc-plated finish. It measures 1.563-Inch x 1.813-Inch x 0.5-Inch. Connector with dual gripping saddle clamp connection, accepts conductors of size 1.468 - 1.25-Inch. Connector is UL and cULus listed. * Inventory displayed is accurate as of 04/25/2019 02:40 EDT.